Welcome to the site of the national governing body of archery in Ireland. 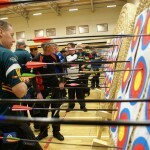 On this site you should find everything you need to know about archery in Ireland. We have a large number of projects currently under way promoting the sport and uniting the clubs in Ireland.